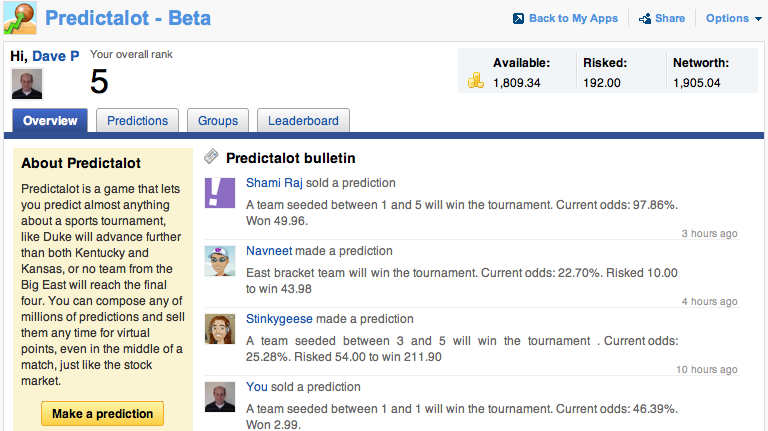 March Madness is upon us and Predictalot, the crazy game that I and others at Yahoo! Labs invented, is live again and taking your (virtual) bets. Filling out brackets is so 2009. On Predictalot, you can compose your own wild prediction, like there will be exactly seven upsets in the opening round, or neither Duke, Kentucky, Kansas, nor Pittsburgh will make the Final Four. You’ll want your laptop out and ready as you watch the games — you can buy and sell your predictions anytime, like stocks, as the on-court action moves for or against you. Predictalot v0.3 is easier to play. We whittled down the ‘Make Prediction’ process from four steps to just two. Even if you don’t want to wager, with one click come check out the projected odds of nearly any crazy eventuality you can dream up. Please connect to facebook and/or twitter to share your prediction prowess with your friends and followers. You’ll earn bonus points and my eternal gratitude. The odds start off at our own prior estimate based on seeds and (new this year) the current scores of ongoing games, but ultimately settle to values set by “the crowd” — that means you — as predictions are bought and sold. For the math geeks, Predictalot is a combinatorial prediction market with over 9 quintillion outcomes. Prices are computed using an importance sampling approximation of a #P-hard problem. What kind of information can we collect that a standard prediction market cannot? A standard market will say that Texas A&M is unlikely to win the tournament. Our market can say more. Yes, A&M is unlikely to reach the Final Four and even more unlikely to win apriori, but given that they somehow make it to the semifinals in Houston, less than a two hour drive from A&M’s campus, their relative odds may increase due to a home court advantage. Here’s another advantage of the combinatorial setup. A standard bookmaker would never dare to offer the same millions of bets as Predictalot — they would face nearly unlimited possible losses because, by tradition, each bet is managed independently. By combining every bet into a single unified marketplace, we are able to limit the worst-case (virtual) loss of our market maker to a known fixed constant. The game was down briefly but is now back up and should be working. There’s a link and an email address in the FAQ section on the left side of the Overview tab. Thanks for playing. Keep the reports coming.